Matt Lauer is taking heat (and deservingly so) for asking whether Mary Barra can be a good mother and run General Motors well. Unfortunately the camera was pointed too much on Lauer - so a full nonverbal analysis of Barra's response for this specific question is not possible. What follows however is a partial analysis of this interview. At 3:41 Lauer begins, "[lip smack] You're a mom, I mentioned ..."
Lauer: "two kids, you said in an interview not long ago, that your mom, that your kids said are going to hold you accountable for one job." Lauer: "And that is being a mom." Lauer: "Given the pressures of this job ..."
Lauer: "at General Motors and being a mom, can you do both well?" 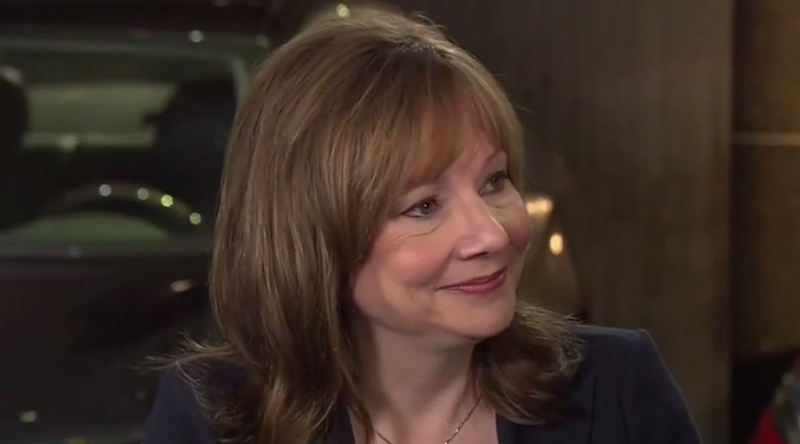 In this moment (3:52), Ms. Barra is displaying a partially suppressed sincere smile. There is a high probability she is recalling the conversation with her children which Lauer is referencing her .... or the thinking of ridiculousness of Lauer mentioning it. Barra's eyelids are partially closed and she has dynamic concave-up furrows in her lower eyelids - which are both absolute requirements of a sincere smile. Her cheeks are also vectored upward. Note we cannot see any of Barra's teeth. The exposure of teeth is not required during a partial or suppressed sincere smile. 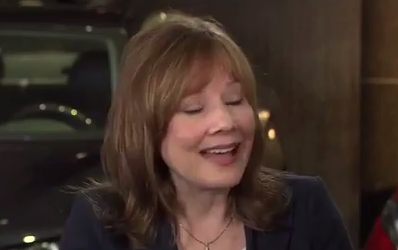 This low resolution image is the first frame of Ms. Barra once the camera is re-directed on her (3:56) after Lauer's parenting question. If we would been able to see her face directly when he was asking this deliberately inflammatory question - it is very likely we would have seen subtle expressions of anger and contempt. However the CEO recovers nicely - and very quickly. An extended blink (prolonged eyelid closure) - or partial closure can often be seen as part of a contempt or disgust amplifier. It can also be associated with anger and emotional processing (as in, "I can't believe he just asked me that!"). It is very important to note that during the other portions of this interview, Ms. Barra projects a high sincerity quotient and specifically displays no signals of deception.